Many of you may already be aware of the superb new ultra running magazine which launched last year, called Ultra. 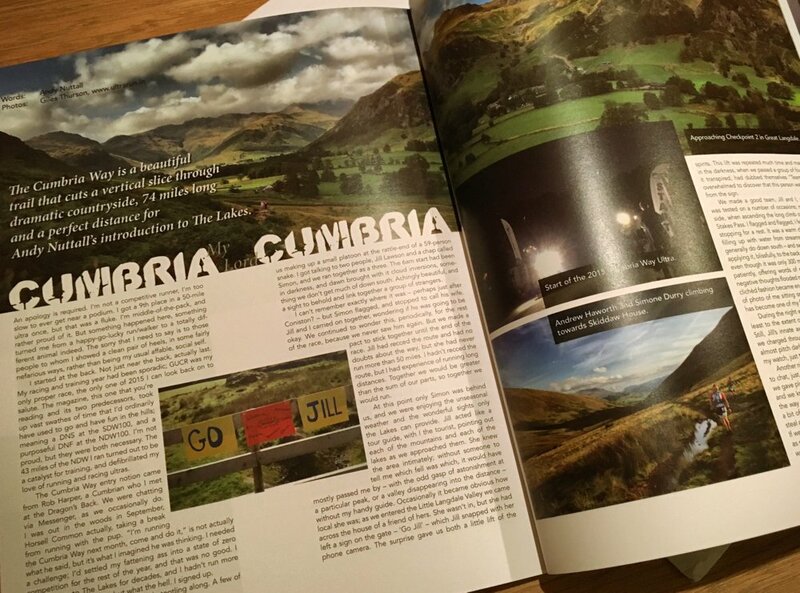 Well issue 3 was published this week and I was extremely proud to see Andy Nuttall’s race report of The Cumbria Way Ultra. Not only was it a great read, as the whole magazine is, but Andy had chosen my photographs to go alongside his four page report. This is the first time my running photographs have been published in print and it was great to see. Regardless of my inclusion, I would strongly recommend anybody interested in ultra running to give this magazine a go. The content is superb, with a great mix of article types from UK runners and those further afield. What’s more, for this issue Andy and the team are donating 90p per issue sold towards the Cumbria Flood Relief, a great cause to aid the rebuilding of the Lake District after the devastating floods in recent weeks. To find out more about the magazine or to order a copy, then pop along to the Ultra website. To join in the chat about not just the magazine but all things ultra running then be sure to check out the new Ultra Facebook group that was launched last week.